iVend Analytics is a set of pre-packaged shrink wrapped business intelligence dashboards which provide a 360 degree, near real time view of a retailers operations. The shrink-wrapped solution utilizes industry pioneering, in-memory Business Intelligence technology to provide browser accessible Dashboard, Analytics & Reports, derived from iVend Retail dataset. The application is licensed as an on-premises solution and has 2 main components. Base application – called the Small Business Server. In addition to this there are 2 user types – Names CALs and Document CALs. 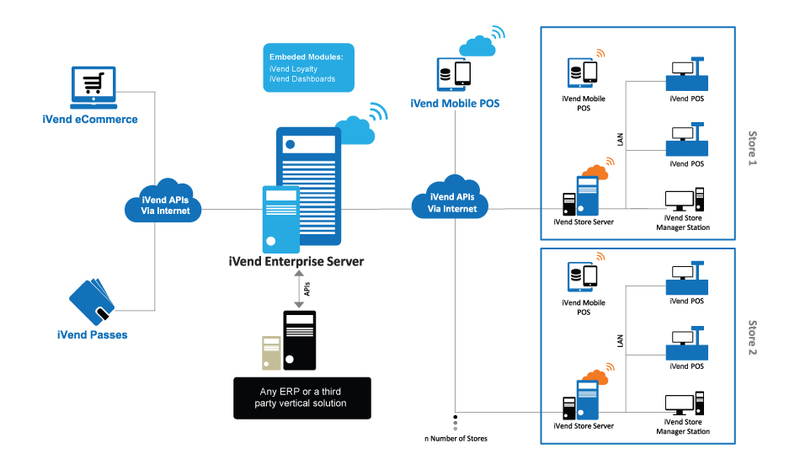 The Small Business Server seamlessly integrates with iVend Retail. Normally the SBS and iVend Retail are installed on a separate servers. The SBS server has a static IP (allowing it to be searched on the Internet). In addition to viewing the dashboards on desktop based browsers, all the dashboards can also be seen in iOS devices like iPad and iPhone. The application is hosted with the installed application server and is accessed through a browser URL. Standard domain-based security model is enforced along with application level authentication to allow only designated users to gain access. The solution is installed to extract data from iVend Retail Enterprise (HO) database at a pre-scheduled frequency, generically over-night. A persistent data connection during user access of the solution is not required, as the extracted data is held locally in a native format. The application has a tabbed layout with an intuitive interface for slicing and dicing data across dimensions. Seeing-is-Believing is the credo behind the analysis presented. Post extraction of data the iVend Analytics application’s data model is refreshed. The in-memory data model utilizes propriety association logic for agile data analysis. The analytics application present pre-defined KPIs and measures; which can be extended on a case-by-case basis to incorporate client specific analysis. Interface objects allow data to be visualized in both graphical & tabular layout as well facility to print and send to excel.